Hello Internet, this is Rambling Josh, and I have some words to make at you. Or more accurately, I had a thought that I really wanted to put into words. Specifically this thought pertains to Square-Enix's latest venture, Final Fantasy XIII-2. On the whole, the original game (Final Fantasy XIII) was not particularly well received. Even those who did like it couldn't pretend that there weren't glaring issues with the game, one of the primary being that it was overly linear, and more importantly, the world felt empty. Final Fantasy XIII-2 set out to fix what the original had done wrong in a major way, and as such the world is full of people to talk to and winding paths to explore. However after a couple days of playing the game (about 10 hours) it seems to me that the world doesn't feel any more alive despite their best efforts. Read on to decipher my cryptic meanings! Now before I get too deep into this, let me throw out a couple of statements in my defense. I was one of those guys who actually liked Final Fantasy XIII despite it's naysayers. So it stands to reason that I was unimaginably excited to hear about a sequel that seemingly fixes all the issues that were present. While I think that is an overstatement, it turns out that what I have experienced of XIII-2 thus far is quite enjoyable and a great sign of things to come. Everything Squeenix has done seems to have been for the better, and yet the new direction creates a new problem unto itself. It's a "little" problem, not really something most people are likely to even notice. None the less, I think it's an issue that a lot of people are going to feel, even if they can't put their finger on it and articulate the issue. Specifically I am referring to the fact that the world still feels dead. Whoa now hold on a second. Two seconds ago I just said everything was sunshine and rainbows, but now apparently it isn't? Well, let me clarify here. Final Fantasy XIII-2 has done a great job of inserting it's game full of people and places to explore and interact with. Every area of the game feels alive and brimming with life (except for the areas that just flat out aren't, of course), however on a bigger scale, the world of XIII-2 just still doesn't sit right with me. What I attribute this to is little more than a function of how the game works, an unfortunate downside. See, every area of the game is it's own self-contained beast. To get around in the game you pop in and out of Time Gates that will take you to some other time and/or place, but these gates are the only things connecting the world. When jump in a new gate, you have no idea where you are going to pop out, and no idea where the new location actually is in relation to everywhere else in the world (unless you are really up on your Gran Pulse geography, from the first game). Sure each individual area may be teeming with life, but because of how you get around each area also feels totally secluded from every other area. Now let's take a step back and think about this for a second shall we? 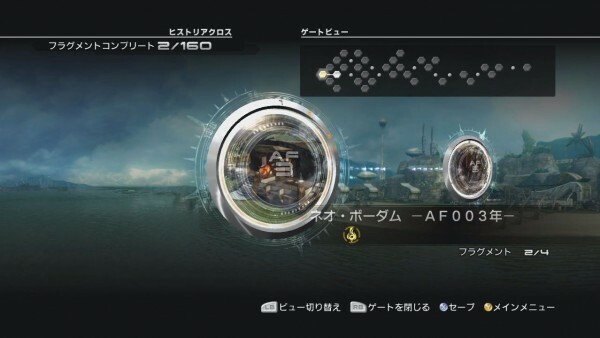 So what if getting around in Final Fantasy XIII-2 consists of pointing and clicking on a spot on the timeline? Was it any different in say, Final Fantasy Tactics? Final Fantasy X? Both of those are games that I absolutely adore. In fact, the world is one of the things I love best about Final Fantasy X. So where does the difference lie? The thing is, point and click or no, the previous game still had connection between it's areas. In Final Fantasy Tactics it's about as rudimentary as it can get. You pick a spot and you go to it. 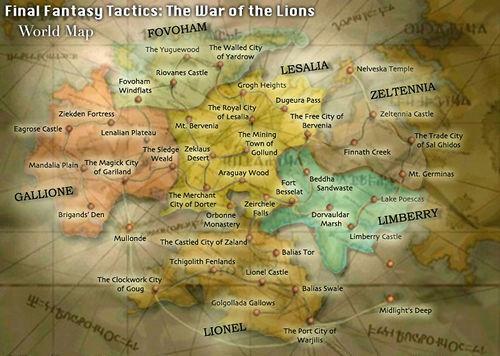 However the difference between that and XIII-2 is that, even though they are both point and click, every single person who has ever played Final Fantasy Tactics can probably tell you that the Mandalia Plains are located to the southeast of Igros Castle. 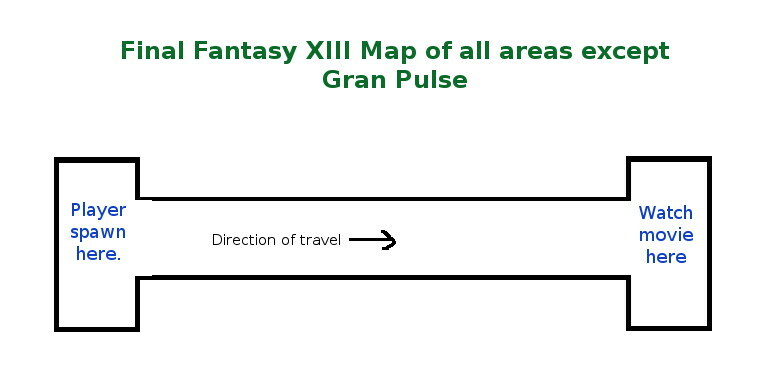 Ivalice may only be connected by lines, but that's more than XIII-2 can claim. 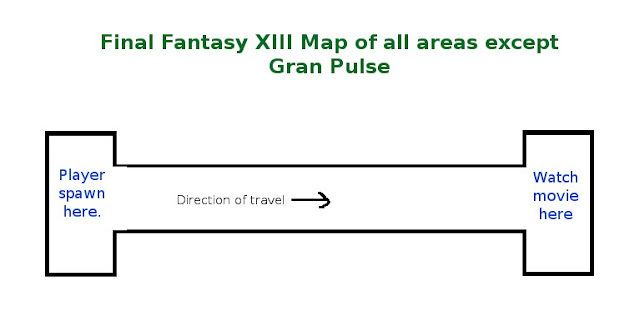 As for Final Fantasy X, well, Spira is a world that is actually very connected. Sure, when you get the airship you pick your destination from a list, but if you really wanted to, you could pretty much walk from one end of the world to the other. There really isn't much stopping you from walking straight from Besaid to Zanarkand (if you count a couple of boat rides of course). Even Final Fantasy XIII was better than XIII-2 in this regard. There may not have been many places to go, but at least getting around felt fluid. Having said all that, you might think 'so what?' and I certainly wouldn't blame you. So what if you can't walk from New Bodhum to the Sunleth Waterscape? The game is all about time travel, you are supposed to be popping in and out of place. This is where I call to your attention a little game by the name of Chrono Trigger. 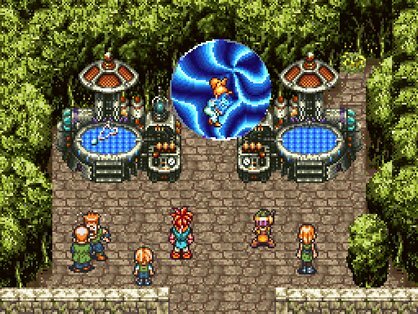 Interestingly enough, Chrono Trigger was another game that utilized time travel as a major mechanic, and yet, it didn't suffer from the same disconnect that XIII-2 does. How does it do it? Well, quite simply, everything is connected, and in more ways than one. When you go back in time to 600 AD, you aren't restricted to a single area, you have an entire world. What's more, you don't pop into 600 AD in some random area, you appear exactly where you had left 1000 AD. This isn't me trying to say Chrono Trigger is a better game than Final Fantasy XIII-2, but simply that the concept of time travel and having a world that is connected and feels alive are very much not mutually exclusive. 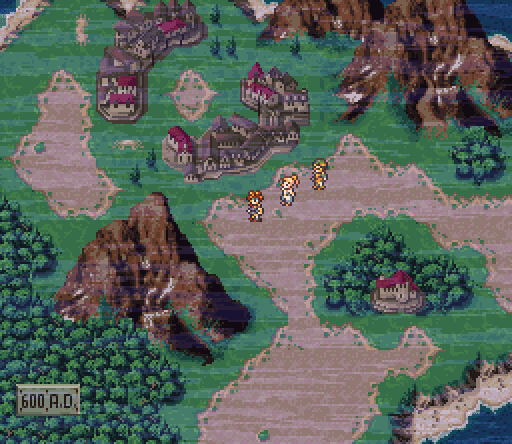 Heck, even the way Chrono Trigger connects the timeline is better, using The End of Time area that you can walk around in rather than a line with a bunch of blips on it. I guess the point I'm trying to make here is ultimately that for a world to feel alive, you need to have a sense of what the world actually looks like. Being able to travel fluidly from one area to another goes a long way, but even if the zones have to be secluded from one another, just having a map can go a long way. Being able to look at a map and see "oh hey, this area is actually right next to this area" gives the player a sense of connection. For ages this wasn't even an issue, because oldschool RPGs always had you walking around the world map. This literally made you experience the connection between places. Nowadays, for whatever reason, RPGs have moved away from this model pretty much across the board, and I can't for the life of me figure out why. Sure you can make your world feel connected without having to render a massive, explorable 3D world, but why run the risk of just creating more problems for your game? I guess I'll just file this one away as another mystery, right beside "why are there no current gen JRPGs?"